Royal Enfield has introduced a new color to its Continental GT 535 cc café racer family. In addition to the GT Red and GT Yellow, this café racer motorcycle will now also be available in the signature GT Black. This new color will be introduced in all markets that sell the Continental GT across the world, in a phased manner. India is the first market to see the new signature GT Black color and bookings for the motorcycle are open with immediate effect. The Continental GT in black color is available at Rs. 2, 13, 142/- on road in Delhi which is the same as the signature GT Red and GT Yellow color variants. Inspired by Royal Enfield’s own 1965 Continental GT, the new GT brings back the philosophy of uncomplicated, approachable, hands-on ‘pure motorcycling’ experience. With its launch in 2013, the Continental GT introduced the Café Racing culture to India. The new signature GT Black color re-emphasizes the motorcycle’s origins that are rooted in the rocker sub-culture of the Swinging 60’s. The stretched out low-profile black fuel tank with knee recesses, low set handlebars, rear set footpegs, genuine clip-on bars and the black bump stop along with chrome upswept exhaust complete authentic period café racer look. The black colour GT features a new brown coloured flat sculpted racing seat with contrast stitching. Royal Enfield worked closely with UK-based Harris Performance to create the bike’s new chassis, which delivers this authentic café racer ride and handling via a nimble double cradle frame as well as new 41mm front forks and twin gas-charged Paioli rear shockers. The Pirelli Sport Demon tyres provide excellent grip, and the Brembo brakes give outstanding response and stopping distance to this meticulously designed motorcycle. 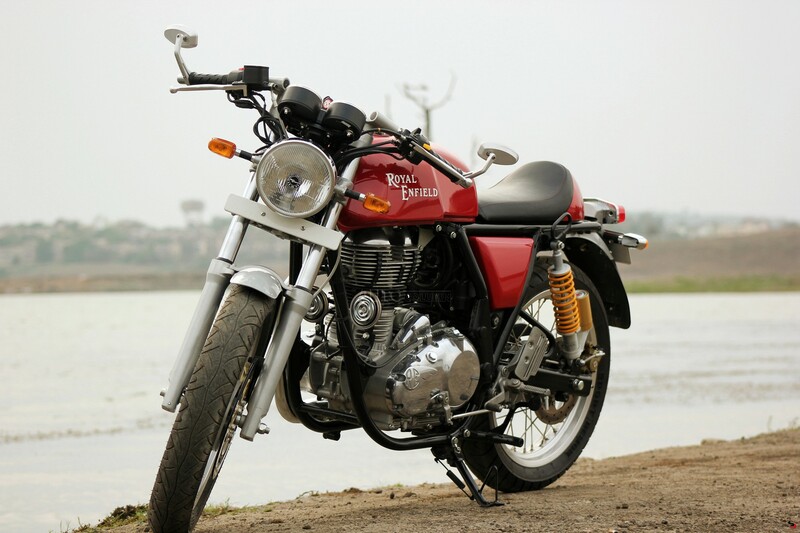 The Continental GT continues to do extremely well globally and it is an important catalyst in realising Royal Enfield’s ambition of achieving global leadership in the mid-size (250-750cc) motorcycle market. The Continental GT is a machine with a story, a nod to motorcycling’s finest hour and the best expression of a cultural phenomenon that has simply refused to fade away – the café racer.